Home > Newsletter Specials > Mothers Polish-Wax-Cleaners > All Mothers Car Care Products > Mothers California Gold Car Wash 64 oz. The cleaning power that has been Mothers™ trade secret for years. Washing your car is the first and most important step in maintaining a spectacular finish. Mothers™ California Gold Car Wash dispenses far more than just a bucket of suds. It sets the standard when it comes to clean. Mothers™ Car Wash was developed to deliver a concentrated and powerful cleaner. Strong enough to tackle the worst grime that the elements, environment, and road conditions create. Bug and cement-like residues dissolve quickly and easily with California Gold Car Wash. 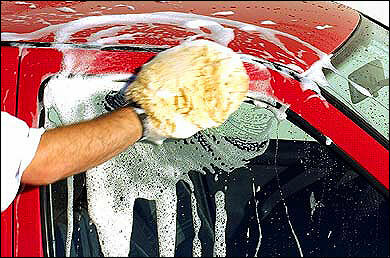 Many cleaners and “soaps” are harsh on a cars sensitive painted surface. Sure, they may clean... but they can also remove more than dirt. They can peel away protective wax, polishes, and at worst can even pit clear coat if left to sit on the painted surface too long. Not Mothers™ Car Wash! While it stands as one of the toughest cleaners available, it is also among the gentlest. Completely non-abrasive, California Gold Car Wash will never remove wax, or diminish polish. In fact, the exclusive formula available only in Mothers™ California Gold Car Wash is PH balanced, further ensuring its gentleness. Even when you don’t have time to use additional products from the Mothers™ arsenal of polishes and waxes to enhance or protect your finish, one wash is all that’s needed to leave your car with a glistening shine. Achieving that close-to-polished look is a Mothers™ Car Wash specialty. That’s because along with being gentle and effective, California Gold Car Wash goes that extra mile and actually resists water spots! It lifts dirt and contaminants safely away from the painted surface, and rinses clean. Leaving the washed area free of grit, grime, and abrasive particulate. With Mothers™ California Gold Car Wash, the only thing left behind is the shine! Mothers™ California Gold Car Wash is more cost effective to use than the most auto shampoos, this is a very concentrated formula. Use only a minimal amount of Mothers™ Car Wash mixed with water to obtain a tremendous quantity of suds. You’ll find you don’t need to keep adding more Car Wash to the bucket; a small amount is all it takes. Get a beautiful clean and bright shine every time you wash your car, truck, motorcycle, ATV, or RV. The advanced cleaning power of Mothers™ California Gold Car Wash is all you need to achieve perfect results. You take the time necessary to gently hand wash your vehicle...use California Gold Car Wash; its the right cleaner when you need the job done right! One of the best auto shampoos! Competitively priced and a quality product that produces decent suds and good cleaning abilities...so, what's not to like?